Størrelse på denne forhåndsvisningen: 800 × 571 piksler. Andre oppløsninger: 320 × 228 piksler | 640 × 456 piksler | 1 024 × 730 piksler | 1 280 × 913 piksler | 3 076 × 2 194 piksler. Kara: "What you think each has contributed to the computer and technology industry, starting with you, Steve, for Bill, and vice versa." Steve: "Bill built the first software company in the industry and I think he built the first software company before anybody really in our industry knew what a software company was, except for these guys. And that was huge. That was really huge. And the business model that they ended up pursuing turned out to be the one that worked really well, you know, for the industry. I think the biggest thing was, Bill was really focused on software before almost anybody else had a clue that it was really the software." Walt: "Bill, how about the contribution of Steve and Apple?" What Steve’s done is quite phenomenal, and if you look back to 1977, that Apple II computer, the idea that it would be a mass-market machine, you know, the bet that was made there by Apple uniquely—there were other people with products, but the idea that this could be an incredible empowering phenomenon, Apple pursued that dream. Then one of the most fun things we did was the Macintosh and that was so risky. People may not remember that Apple really bet the company. Lisa hadn’t done that well, and some people were saying that general approach wasn’t good, but the team that Steve built even within the company to pursue that, even some days it felt a little ahead of its time—I don’t know if you remember that Twiggy disk drive and…"
This image, originally posted to Flickr, was reviewed on 12 January 2008 by the administrator or reviewer File Upload Bot (Magnus Manske), who confirmed that it was available on Flickr under the stated license on that date. 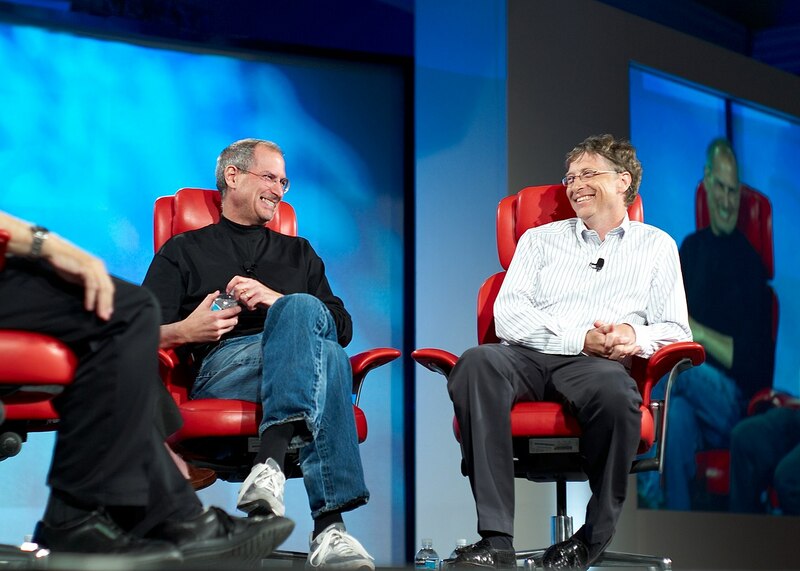 This image has been assessed under the valued image criteria and is considered the most valued image on Commons within the scope: Steve Jobs and Bill Gates. You can see its nomination here.